Some exchanges this week reminded me of the value of George Orwell’s five effective rules for writing. The rules can be challenging, especially if you’re using the iPad one-finger text editing which under version 7 of its o.s. seems even more awkward than before. The five rules are also an unstated exhortation for proof-reading, which is also often a challenge – http://en.wikipedia.org/wiki/Proofreading#Self_proofreading.2Fcopy_editing . For even the word “outright” might be a qualification too far. There’s something about words that can be qualified or explained with speed, tone and body language, but which sits stark on screen or paper. Web-site comments are chock full of barbarity, often in the guise of wit, and almost always under a pen-name, used to suggest bravery from the pen-smith who would otherwise no doubt be got for telling the truth. Now I know the alternative of extreme civility can be tedious – witness the codes of conduct for the House of Commons. But the barbarity does diminish the potential of the internet. It detracts from us all. Problem now is in a paperback’s worth of stuff on my text blog, and over 700 entries on my photo-blog, just how many of the transgressions of the ‘five’ rules will I have committed! 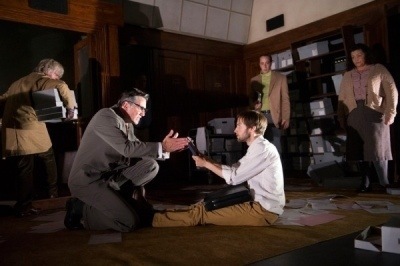 The play is a reminder of just what colossal ideas George Orwell had in writing this story. 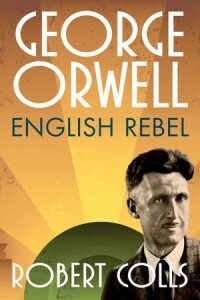 Many have written about “1984” and there’s a full summary of the book and its ideas at http://en.wikipedia.org/wiki/Nineteen_Eighty-Four (interesting that wikipedia itself has managed to acquire a reputation of something not to be trusted, even though it is subject to review by the surfers of the world). A survey last week found that “1984” was one of the books that people most claimed to have read when they hadn’t. I was surprised to find young colleagues at the council being unaware of the book, but knowing about “Big Brother” cos of the TV series. Watching the play, I was angered about this and had my own private “two-minute hate”; well – two seconds. As it happens, I did read the book! Whilst doing maths and science in sixth-form, and I found it a bit of a chore. But you pick up on it again through the years with films and documentaries, and knowledge of it is a pre-cursor to enjoying the play – which packs a lot into its 100 minutes duration. “1984” suffered before 1984 as being seen as a warning against life in the future when it was always a commentary on what had happened already by 1948. http://en.wikipedia.org/wiki/Nineteen_Eighty-Four#Some_sources_for_literary_motifs It was also portrayed as an anti-communist story when it was so much wider than that, including in its range of political targets. The play is chock full and could do with a few more moments of silence to absorb the significance of some of the key lines and key moments. And if the 1984 film production didn’t have enough torture to make the significance of ‘I haven’t betrayed Julia’ proclamation understood, the emphasis of the torture shown in this production is to say that torture is terrible. This new wrap suggest a debate as to whether “1984” might ever have been a true story – well it wasn’t – “Nineteen Eighty-Four a novel” – and this matters because of Orwell’s belief that the truth matters. The wrap also introduces Winston Smith as a weak, confused figure, a wreck. This means Winston doesn’t acquire any gravitas; hard to believe that he might have ever had the self-knowledge and inner confidence to develop the view that things aren’t right and something must be done. Never liked the bit in the original story whereby Winston agrees to all the horrible things he’s prepared to do – kinda out of character with his love for something better for the unborn. And ‘picture the future – a boot stamping on a human face, forever’ was strangely violent given the emphasis on mind control through language in “1984”. Rather – “picture the future – the 24 hour journalist depressing the notion of something noble being possible, putting it down with the snide judgemental end of every piece, forever” (DUCKSPEAK); oh, and sung to ‘ring-a-ring-a-roses’ (instead of ‘oranges and lemons’). If I’d been looking for a twist for “1984”, I would indeed have focussed on modern media, and the control of music by X-factor (PROLEFEED). Finally, as I’ve come to understand the play more, I’ve been revising this review (including taking from quite a sharp comment on the importance of the appendix). This I hope is seen in the spirit of Orwell’s writing process, rather than Winston and his memory-holes. 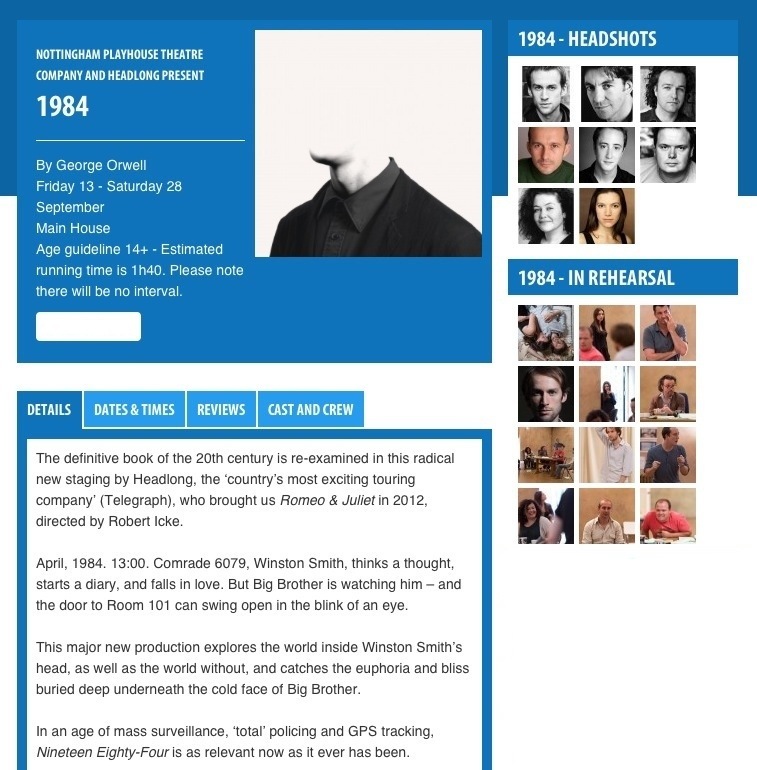 1984 at Nottingham Playhouse – http://www.nottinghamplayhouse.co.uk/whats-on/drama/1984/ – so pleased to have seen it – memorable lines in a memorable production. Some twists too. P.S. Still getting criticism from a surfer who challenges me to corresponf, but whose e-mail address doesn’t work.